You are on your way to work thinking that this will be much like any other day when a car crosses over from the opposite lane and crashes head on into your car. Fortunately, your airbags deploy and you are wearing a seat belt, but the force of impact throws you into shock and you immediately feel pain in your ribcage, head and neck. The damage to your car is significant but you are in too much shock to take it all in. This is the kind life changing event that happens to someone in Ontario every day. The accident victim is not the only person affected by a car accident. Accidents also take a huge toll on the families of injured persons, in terms of loss of income, loss of a caregiver, and substantial medical and rehabilitation costs during the recovery period. Unsurprisingly, car accidents are one of the most common reasons for filing personal injury claims in Ontario. Car accident victims and their loved ones have available to them various options for obtaining compensation for the many losses arising from serious injury. The Injury Lawyers of Ontario (ILO) car accident lawyers specialize in personal injury negligence suits and accident claims, and are well able to answer questions about your legal rights, the strength of your case and potential next steps for obtaining compensation. The most recent Ontario Ministry of Transportation report of annual road safety statistics determined that drinking and driving is still the number one cause of car accident related fatalities. Other situations that contribute to a significant number of fatalities are: collisions involving large trucks, pedestrian fatalities, distracted driving, speeding and failure to wear a seat belt. On average, one person in Ontario is killed in a motor vehicle collision every 15 hours, and the vast majority of these collisions are car accidents. Numerous studies have determined that most car accidents are preventable, meaning that in most cases, the collision resulted because a driver was careless or negligent. Ontario legislatures have attempted to address this problem by passing various laws that focus on the primary causes of car accidents. The Making Ontario’s Roads Safer Act (Bill 31) which became effective on September 1, 2015, addressed the increasing incidence of distracted driving. Drivers who are found to be texting, talking or interacting in any way on a hand-held phone or other communication or entertainment device while driving will face a stiffer fine, a maximum of $1000, and three demerit points on their licence. Novice and young drivers (with a licence classification of G1, G2, M1 or M2) who are convicted of any violation (including distracted driving) will receive a 30-day licence suspension for a first offence and increasingly longer suspensions for additional offences. Car drivers face a fine and three demerit points if they ‘door’ a cyclist, or a $110 fine if they fail to keep a one meter passing distance from cyclists wherever possible. Motorists are also obligated to slow down and move into another lane when they approach a stopped emergency vehicle or tow truck with lights flashing; failure to do so can result in a $490 fine. Bill 31 is just the latest in a serious of changes to Ontario legislation aimed at preventing injuries and death due to car accidents. Other recent changes include stiffer sanctions for drinking and driving, limits to speeds for large trucks, and legislation to deter street racing and stunt driving. While some people are criticizing the stricter laws, anyone who was injured in a car accident resulting from driver negligence welcomes any changes that will make Ontario roads safer. The type and severity of injury resulting from a car accident varies significantly. In fact, a car accident may result in injuries to every part of the body, in severe cases. However, there are certain injuries that tend to be most common. One of the most common injuries experienced by drivers and passengers in a car accident is a head injury. Such injuries may be largely external, such as lacerations (cuts and wounds) and contusions (bruises). Also not uncommon are brain injuries which can range from a mild concussion to traumatic brain injury. Traumatic brain injury is an injury that results from an event involving an external physical force, and causes impairment of physical functioning or cognitive abilities. There are many symptoms associated with brain injuries, including seizures, headache, vision impairment, ongoing fatigue, speech impairment, memory loss and difficulty concentrating. During a car accident, a person’s neck may suffer minor soft tissue injuries, neck strain or mild whiplash. More severe neck injuries can result in serious nerve damage (cervical radiculopathy) and spinal injuries (such as a herniated or slipped disc). Some of the symptoms that may be experienced with a neck injury are headache, neck pain, pain in the shoulders or arms, neck muscle spasms, reduced range of neck motion, and numbness or weakness in your arms and hands. Possible injuries to the face include scrapes, lacerations, contusions, fractured bones and dental injuries. In a car accident, these injuries may result from an impact from the dashboard, airbag, windows or steering wheel. The severity of facial injuries and many other injuries is much greater when the vehicle occupant was not wearing a seatbelt. Depending on the severity of the car accident, the point of impact with another vehicle and other factors, car drivers and passengers may experience many other injuries as well. There may be broken arms, bones, shoulder injuries and internal injuries. Many car accident victims suffer from psychological and emotional injuries, particularly after catastrophic car accidents. If someone in the vehicle or a loved one lost their life as a result of the accident, it is not uncommon for family members to experience short of long term psychological injuries such as post-traumatic stress disorder (PTSD). The most common scenario in multiple car collisions on Ontario highways involves a rear end collision when cars or trucks fail to stop in time for traffic congestion or construction. Many of these incidents result in serious injury or death for car drivers or passengers, particularly when heavy trucks are involved. In the vast majority of rear end collisions, the driver(s) in the rear are held liable for the damage and injuries that result. In a horrific car accident in 2010, 22 year old Bethany Benson fell asleep with her feet on the dashboard while her boyfriend was driving on Highway 401 near London, Ontario. The collision occurred when their car slammed into the back of a tractor trailer truck that had stopped due to traffic. Both Bethany and her boyfriend were wearing a seatbelt, which is credited with saving their lives. When Bethany’s airbag inflated at more than 300km/hr, her knees were hurled into her head and eye sockets and her feet were thrust through the windshield. Her boyfriend, the driver, experienced significant lacerations to his face, hands, chest and neck. However, Bethany’s injuries were much more severe: her left eye socket, nose and cheekbone were broken; both feet had multiple broken bones; and severe brain trauma resulted in memory loss, a diminished ability to concentrate and learn, personality changes, and various psychological problems. The car accident caused life-changing and permanent injuries for this young woman, and significant distress and challenges for her family as well. The most important step to take following a car accident is to get a medical assessment and treatment for your injuries. You may not be aware of how serious you were injured; some injuries take a few days or weeks to manifest. There is, in fact, substantial evidence that many injuries worsen if left untreated. For example, if you have experienced even a mild concussion, you will be advised to rest and avoid physical and mental tasks, to allow your brain to heal. Report the facts of your accident immediately to your insurance company. If you wish to file a claim, the insurance company must be notified within seven days of the car accident. As soon as you are able, write down the details of the accident so that they will be remembered when they are needed to support your claim. Some of the important information that should be recorded includes: the names of all the people involved in the collision; witness names and phone numbers; the time, visibility and other circumstances of the accident; how and why the accident occurred; and so on. In the days following your car accident, record your visits to health care workers, how you are feeling, and any changes in the way you are able to function. When you were injured in a car accident, you can make an accident benefits claim for your losses to your insurance company. Through Ontario’s ‘no fault’ insurance process, anyone can claim for statutory accident benefits regardless of their fault in the accident. You need to report your accident and injuries to your insurance company within seven days of the car accident, or as soon as you are able. Your insurance company will give you an Application for Benefits Form which must be completed and submitted back to them within 30 days. If you were seriously injured in a car accident that was caused by another driver’s negligence, you are entitled to sue the ‘at fault’ person for your loss or ‘damages’. Injured passengers, pedestrians, cyclists and other drivers injured in the car accident are eligible to seek compensation from the negligent party. Family members of a vehicle occupant who was killed in a collision may also claim for damages. 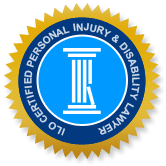 It is a good idea to hire a personal injury lawyer because they specialize in negligence suits and have substantial expertise and experience in dealing with insurance companies. In the majority of cases, your lawyer can negotiate a better settlement than you could achieve on your own. The Injury Lawyers of Ontario (ILO) are highly experienced car accident lawyers that serve most communities in Ontario. In an initial no-obligation consultation, they can assess the value of your claim. Depending on the nature and severity of your injuries, you may be entitled to sue the ‘at fault’ party for pecuniary damages (monetary losses) for any expenses that resulted from your car accident, and non-pecuniary damages (pain and suffering) for your loss of enjoyment of life. Lost past and future income, if you are unable to work and earn money in the same capacity. Medical and rehabilitation expenses not covered by OHIP. Housekeeping and home maintenance services (for functions that you are no longer able to perform). Property loss arising from the accident, such as glasses, hearing aids. When you choose an ILO lawyer to represent you in seeking compensation for your losses, they will be available throughout your settlement process to answer questions, give advice and support you in any way that they can. Your attorney will immediately begin to gather evidence that supports your claim for damages. This will include evidence of the circumstances of the accident that resulted in your injuries, as well as evidence of the severity of your injuries and how much they altered your life. Your lawyer will obtain any relevant police reports, eye witness testimony, medical reports and relevant evidence that they know to be important through past experience in tort (negligence) claims. It is also reassuring to know that they will handle your claim deadlines and submit any required documentation that must be filed. In the vast majority of cases, your ILO attorney will be able to negotiate a settlement for you without having to go through a formal trial.